Last Christmas, I was in the southern-Spanish countryside of a tiny village, volunteering in exchange for food and accommodation via HelpX on the property of Cuesta Viñas. All you'll need for endless laughter and fun is some string, two knives, and two empty wine bottles. Tie a piece of string to one of the knives, then tie the other end of that string around the waist of a player so that the knife hangs down their back side - over their rear. Tie it so that the knife doesn't hang so low, since longer hanging strings are too easy. Do the same with the other knife and string, and tie it to player #2: the opponent. Both players race against each other to try to get their knife in the bottle first. This requires some squatting, and is really fun to watch. Using those same two wine bottles, you can play another game, which I have named "Wine bottle walk". Mark a starting line on the floor. We used the edge of a rug as our starting line. Your feet must stay behind this line. Put your hands on the bottles and walk forwards as far as you can. Someone else should throw a coin or some sort of marker to whatever point you reach (if it's farther than the others), but it only counts if you can get back to the start line without falling. The person to go the farthest wins. I think after the first round of people, we all got a second chance to beat the record. It's a lot harder than it looks! For this next game, all you'll need is a cardboard box. Thinner cardboard that's easier to rip is preferable. In the first round, everyone must bend down - without touching hands or knees to the floor - and pick up an edge of the box with their teeth. After everyone does so, someone cuts off (or rips off) an inch from the top of the box, and thus begins round two. As the box gets shorter and shorter, it gets harder to pick it up with your mouth. Warning: Play at your own risk! This game may cause injury (or pain) to your neck. Most of us who tried it later wished that we hadn't! You'll need: two chairs and a small stool (or light piece of short furniture). Rest your head (neck up) on one chair, put your feet on the other, and rest your rear on the short stool or end table. When you're ready to begin, remove the stool/small furniture from underneath your tush and pass it around your waist, counting the number of times you pass it around. 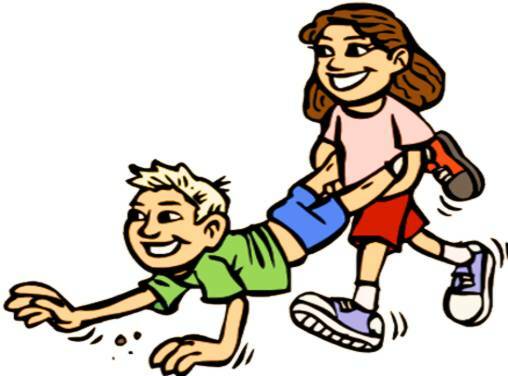 This wasn't exactly the safest game to play, but our hosts had set up a wheelbarrow race after breakfast that morning. We were put into teams of two, and two teams raced against each other at a time. There was a short ramp each team had to wheel over, and then a brick at the halfway point that each team had to push around before changing directions and running back to the finish line (aka start line). All of these games that I played last Christmas provided hours of entertainment! They're so simple and require such few materials; I was surprised that I had never played most of them before. Have you played any of these games before? Are you going to try some at your next big get-together? What games are always a hit at your parties? At the end of November I blogged about a public art display I had seen in September in Madrid, but hadn't known what it was. The art project was called "Las manolas y los Manolos de Cascorro," and it strove to showcase the diverse community of Cascorro, the neighborhood/plaza in which the project was displayed. This in turn was to represent the diverse community that is society. 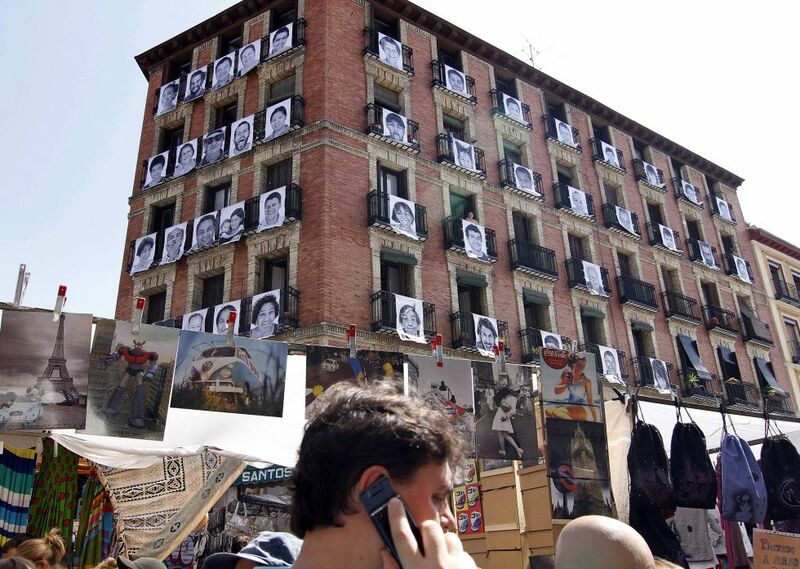 They took pictures of 76 people that had been walking down the street in that area, and with the help and support of the neighbors that offered their balconies for the project, put the portraits on display. The cultural association "La mitocondria" collaborated with the Italian photographer Antonio Arcaro and the neighbors of the area, in order to make this art project a success. INSIDE OUT is a large-scale participatory art project that transforms messages of personal identity into pieces of artistic work. Everyone is challenged to use black and white photographic portraits to discover, reveal and share the untold stories and images of people around the world. These digitally uploaded images will be made into posters and sent back to the project’s co-creators for them to exhibit in their own communities. People can participate as an individual or in a group; posters can be placed anywhere, from a solitary image in an office window to a wall of portraits on an abandoned building or a full stadium. These exhibitions will be documented, archived and viewable virtually." If anyone's interested in reading the article that appeared in El País about the project in Madrid, it can be found here. I had actually seen this TED Talk in 2011 when the prize was awarded to JR, so I was really excited to find out that this art project was a part of his Inside Out challenge. That's one of the great things about living in a European capitol city. A year ago today was a Saturday, and I was in Oliva - a small pueblo just south of Valencia along the Mediterranean coast. My old roommate Gregorio's parents live there, and this was the first time that I went to their house. We had arrived in Oliva that Thursday evening, and at the end of the day on Friday I asked Gregorio, "How old is your father?" Gregorio did some calculating, then answered, "Well tomorrow he'll be...[I don't remember what age he said!]" "Wait, wait, wait, what do you mean tomorrow?" "His birthday's tomorrow," Gregorio said. "What? But nobody's said anything about it. Are you pulling my leg?" He laughed and said, "Yeah, it's tomorrow. Really"
I didn't know whether I should believe him or not, as he's always pulling practical jokes on me. Saturday morning when I woke up, his parents had already left for "la casa de arriba" (the upper house, which is their house up in the hills, away from the coast/town. We would be having lunch there, I was told. I was excited to finally see this casa de arriba because that's where Gregorio's parents' dogs live. That's also where Gregorio gets all his fruit from; whenever he'd return to Madrid from his parents' house, he would always bring back crates and crates full of huge Valencian lemons and oranges. We went inside the house and saw Gregorio's father watching television in the living room. Gregorio didn't say "happy birthday" (well, feliz cumpleaños) to him or anything, so I didn't say anything either. Because it had probably been a joke to try and get me to make a fool of myself. Paella. Homemade, authentic paella. Made by a Spanish mother on the Spanish Mediterranean coast. Wow. She was nearly done by the time we had arrived, so we soon carried it up to the dining room. As we were sitting down, Gregorio's dad went to wash up his hands or something. Then Gregorio said to his mother, "Let's have this champagne for dad's birthday." His mom whispered back, "It's today?!" "Yes, December 10," he said. *gasp* "Es verdad!" (you're right! ), she said. I probably gasped myself. I couldn't believe that nobody had said anything yet about his birthday, and wondered if he had forgotten himself, or if he was waiting for someone to say something. So when Gregorio's father sat down at the table to eat, Gregorio said something along the lines of, "Let's have this champagne for your birthday, dad. Happy birthday." His dad grinned. Later I asked Gregorio's mother if there was anything they normally did to celebrate birthdays. "Oh no, we [she and her husband] don't celebrate them," she told me. "They're just like any other day." So that explains it. I'll never forget December 10, 2011: the first day I ate homemade paella in Spain, and Gregorio's father's "forgotten" birthday. When my sister and grandma visited me in Madrid for a few days back in July (before we headed to Germany together), one of the places we visited was the ONCE Museo Tiflológico (ONCE Museum for the blind, essentially). If you recall from this post, ONCE stands for Organización Nacional de Ciegos Españoles (National Organization of Spanish blind people) -- and they sell lottery tickets! I had never heard of this museum before, but the sister had seen it on a list of free things to do in the city, and it looked interesting. The phrase "un museo para ver y tocar," is found on the museum's website and brochures, meaning a museum where you can see and touch things. This museum is the first of its kind in Spain, and it opened on December 14, 1992. The building is easy to spot, as it features the ONCE logo with a bright yellow strip across the top. After we had signed in downstairs, we took the elevator up to the museum. When we exited the elevator and headed towards the main desk, a voice recording said that people had entered the museum. This way, the blind woman working the front desk would know we were there. She gave us a brief run-down of the museum, which I later translated to my grandma and sister. The museum was split into three main sections: salas de maquetas, the room of scale models (of buildings); salas de obras de artistas, rooms of works made by blind or visually impaired artists; and sala de material tiflológico, the room of materials used by blind people through history. We started in the sala de maquetas. When we walked through the doorway to enter that section, a recorded voice said that we were now entering the sala de maquetas. This allows ciegos, bind people, to know where they are going while visiting the museum, as well as the woman working to know where the visitors are. We walked down some stairs to get to the last room, which featured some materials and tools used in daily life throughout the history of the blind. This exhibit also included multiple displays of old ONCE lottery tickets, of course. And that ended our visit. If you've never been, I would highly recommend going to the ONCE museo tiflológico (especially if you live in Madrid). First, it's free. Second, you can touch the exhibits! And finally, it's not your average museum so you'll probably learn a thing or two, or spend some moments thinking about the world from the perspective of a blind person. And again, my favorite part was the room with all of the scale models of famous monuments, so you've got that to look forward to as well. Has anyone else been to this museum? What about a museum for the blind in a country other than Spain? In preparation for the race, Hannah and I had pasta (with tuna, tomatoes, and eggs) for dinner the night before, then went to bed early. On Sunday morning put on our running shoes, attached our numbers, then headed to Atocha to meet up with another frisbee friend who was also running in the race. Here's a video of the beginning of the race, though I couldn't hear the gun shot from where we were. We didn't cross the start line until 1:30 or so, but each of our numbers had electronic chips attached to keep track of our individual start and end times. It was a pleasant day for a race, good weather, and it was fun to run through Madrid's downtown - past all the tourist spots - with 10,000 other runners, not tourists. I went just a bit faster than my normal Reca-jogging pace, and felt good throughout the race. Just a few side cramps at one point. And I had energy to kick it up a bit at the end of the race, so I wasn't really running at race speed. My final time was 1:01:25, so just over an hour. So now I know what a 10K feels like, that it's very doable, and the time I should aim for in my next 10K. I completely forgot that they videotaped the finish, so you can see me briefly here. I wish I would have remembered and done something cool for the camera. At 1:02:56 I'm in view on the right side and at 1:02:58 I'm easiest to see. Bright yellow shirt (as pictured in photo above). Far far right of the screen. But just for a split second. The first place runner finished in 31:15! This race raised 20,000 euros for the food bank. Registration only cost 10 euros, and came with a jersey and draw-string bag. Water was provided between the 5th and 6th kilometers, and we were all given a banana, water bottle, and powerade when we finished. I highly recommend this race to anyone that finds themselves in Madrid next September! Today Hannah and I went to pick up our number/shirts for the Madrid Corre Por Madrid 10K we're running on Sunday. There was a bit of a line, so we eyed up our competition while waiting. My plan to run every Monday, Wednesday, and Friday night this month fell through after my first two runs. I ended up having plans on those non-frisbee nights, you know, with things like helping at the 2nd division ultimate frisbee national championships in Alcobendas, playing Settlers of Catan with friends, painting Hannah's wall green, and being in Málaga. But I also learned my running plan was not the way to prepare for a 10K anyway. Cross-training by going to ultimate frisbee practices every Tuesday and Thursday was helpful, and in Málaga I did some sprinting routines on the beach a couple of nights. Regardless of the little preparation, our goal is still just to finish without walking and to have fun. We might bring a disc along and try to throw (but with 10,000 other runners I'm not sure if there will be space...). My four nights, five days in Málaga were exactly as I'd hoped: Filled with beach, sun, and reading. Since I had already visited (and explored) Málaga last fall, this time I only wanted to relax on the beach under the sun. I arrived Friday evening and took a walk to the beach with a book and stayed until the sun went down. I spent the following three days on the beach, from sun up to sun down. I did lots of reading, some snoozing, and got a good feel of the coast in my bones. On my last day, Tuesday, it was quite cloudy and not really ideal beach weather. That was fine with me, as I had spent the previous three days on the beach. I walked around other parts of the city until it was time to catch my bus.